Alaska salmon fisheries contribute millions of dollars to the state economy annually and provide Alaskans with a valuable food source. To allow fisheries user groups the greatest possible harvest without jeopardizing long-term sustainability, the Alaska Department of Fish and Game relies on its Fisheries Sonar Program to provide timely information about salmon run strength. 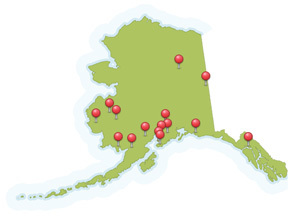 Take a virtual tour of the 15 state sonar sites ADF&G operates on 13 rivers throughout Alaska. We use many tools to gauge salmon run strength, but few of them can provide us with inseason information on the size of a run close to the fisheries that intercept them. Traditional tools such as weirs and counting towers can be used to count salmon in clear, narrow streams or tributaries, but not in wide, turbid rivers. To gauge salmon runs we can’t see, we have taken a lesson from one of Mother Nature’s fish-finding experts. In glacial silt-laden bays and rivers, beluga whales find salmon by emitting high-pitched calls and listening for returning echoes. Similarly, we have adopted sonar as a tool to detect salmon not by sight, but by sound. Learn more about how sonar is used to detect fish in rivers. This project was partially funded under award NA08NMF4380597 from NOAA Pacific Coastal Salmon Recovery Funds administered by the Alaska Department of Fish and Game, Alaska Sustainable Salmon Fund.